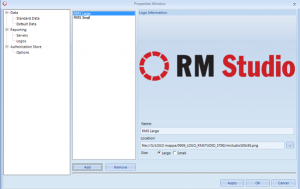 The Properties window in the Main Menu is used to manage the Standards deployed in RM Studio under Data, the Reporting for RM Studio local reports, and the Web and Email Configuration. Step 1) To deploy a Standard into RM Studio, you will have to have bought the Standard and have the right key registered in the registration window. 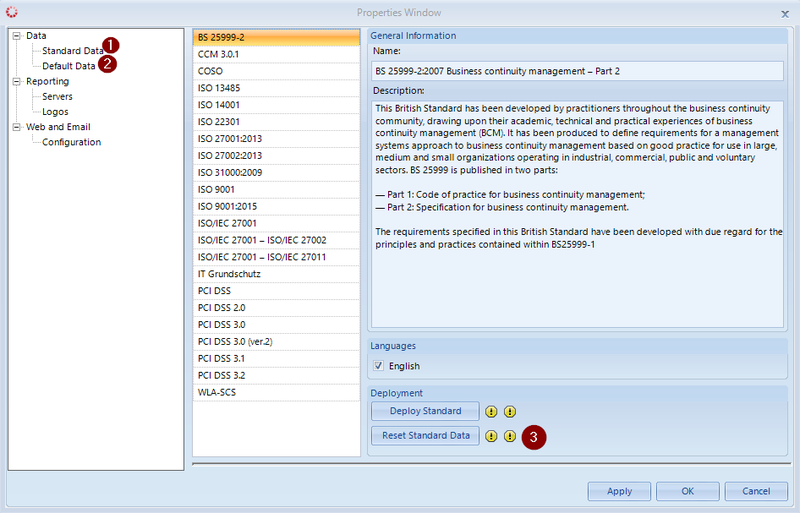 If all these steps have been completed the Standard Data window should show the Standards available to you. The key you have registered will open up the standards you can deploy and the standards you cannot deploy are greyed out (locked). Further detail on installation of Standards will be covered in the chapter “STANDARDS“. Step 2) Administrators can reset all predefined data to their original state. This action will only reset the data that came with the software and will not affect Threats, Categories, Evaluation Templates or Threat Categories created by the user after installation of RM Studio. When you have selected the option you would like to reset press the Reset Default Data button. When pressed all changes made to the selected data will be reverted to its original state. This will not affect data entered into the Risk Management and Risk Treatments. Under Logos (image ) you will find a list of the logos you can use when generating Reports from RM Studio. This list is empty by default.You can upload your own logos.When you add a logo to the RM Studio application you will have to define them as “Large” or “Small”, this categorizes the logos so that they will appear in the respective lists when you generate reports. Large logos are used for the front page and Small logos are used for the header of each page in the report. Please note, in case you are using Reporting Server it must have access to the location where the logos are stored. See the Email Configuration section for information on how to configure email.